The only Photoshop & Illustrator Alternative you will ever need. I know that the title is a bit brave but we have been testing both Affinity Designer & Affinity Photo for a while and we are absolutely gobsmacked. Let me start by saying that this software has been produced by the company called Serif and both programs are the best competitors for Adobe’s Photoshop and Illustrator (in our opinion… ). Since Adobe got its customers hooked on subscriptions in 2014 we have been looking for good alternatives. Simply because as a business you should never restrict yourself to only one software provider. As a Web and Apps development specialists, we have been looking for software that can in some stage replace Photoshop, Illustrator, InDesign, AfterEffects, Xd and Dreamweaver. Obviously, if we can save some money in the process that would be a bonus. I know, most of you would ironically say “Good Luck” knowing that if you want to be professional in designing websites manipulating images or creating icons for apps you need to use the Adobe. For the last few months, we have been testing software like Sketch, GIMP & Corel Photo-Paint. There is nothing wrong with them and it would be wrong to say that they’re bad. However, they all involve a steep learning curve. We all know the biggest downfall of a new software is to learn how to do things. We had to learn new ways of editing images, optimizing them for the web and adding various effects like shadows or shades. Fortunately, a few months back we have decided to purchase Affinity Photo and all those problems have disappeared. Affinity Photo interface is similar to Photoshop and most functions we used are identical. 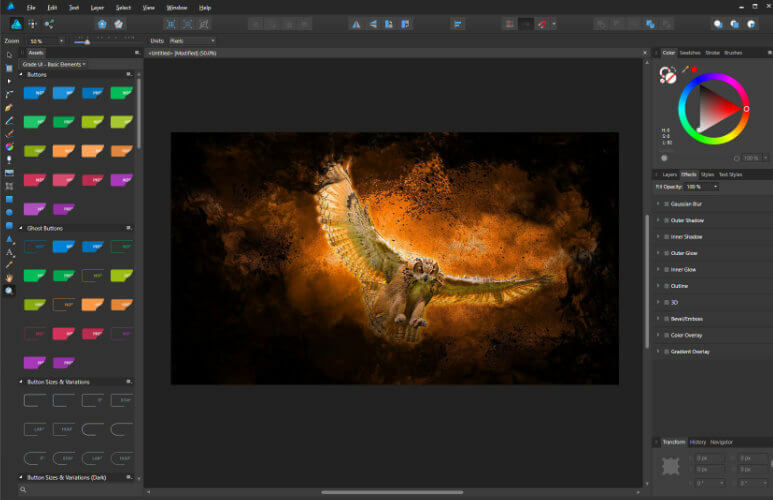 Affinity Photo is fast, in some cases, its even faster than Photoshop and smart default layout will let you access the effects tab with just a one clink 🙂 . The support from the Affinity Team is just great. They’ve usually respond within 60 min and never longer than 24h. 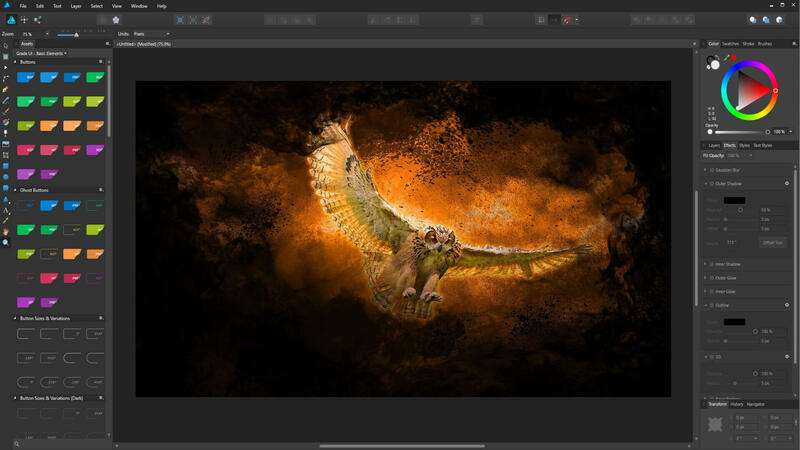 Apart from that, you will find a lot of tutorials and forums that will tell you how things are done in Affinity Photo. All this for just £48. Individual licences – same as old Adobe Software -wow! For the Illustrator alternatives, we have tested Corel Draw and Inkscape. Again, both good, but the aim here is to find the best Illustrator alternative! The Affinity Designer is no different than Affinity Photo in terms of performance, and its interface is similar to Illustrator. We have recently created the London map in dotted pattern and transferred the file from Affinity to Illustrator and vice versa with no problems. This App in its layout is similar to Illustrator, even the keys shortcut are identical. This really has been created for us to have a smooth “migration” process. We haven’t tested the Designer for 3D graphics but please bear in mind, this review is for web developers and we’re using this software for editing web graphics (in most cases). 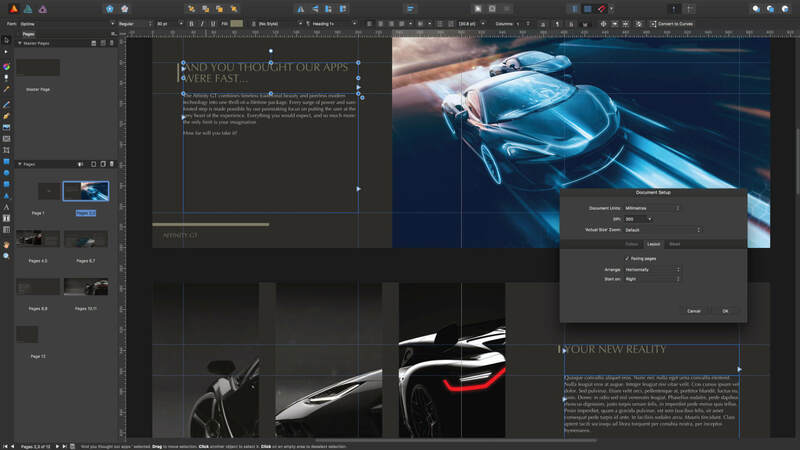 Same as the Affinity Photo the Designer price is just £48! Can’t say much about this product at this stage as it is still in development. However, yesterday we have received *Affinity Publisher Free Beta version which we will test and give you some feedback. From forums and various social media platforms, we have found out that Publisher will be a direct competitor to InDesign. 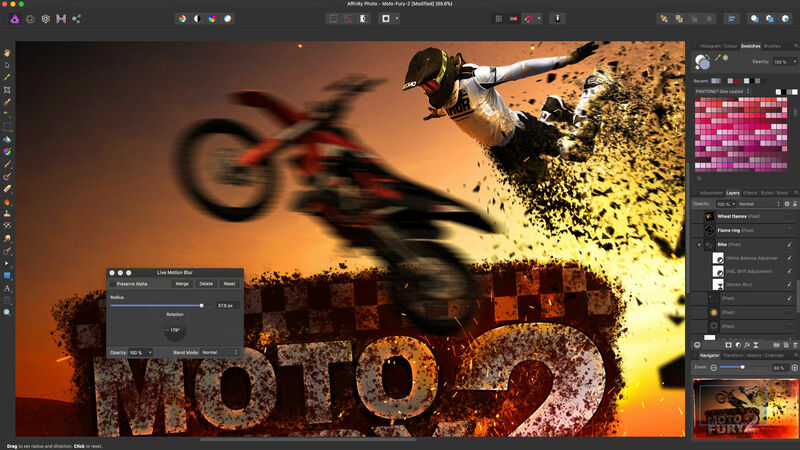 This will make Affinity even more of the competitor to Adobe. Affinity Publisher (in test “Beta” mode) FREE download! Some of you may read this post and say “How about all the other software? I can’t quit the Adobe subscriptions because you are still using the InDesign and Xd or Dreamweaver”. Yes, you are correct, but let me give you an example. If you have 5 developers/designer which all need to use Photoshop/Illustrator/Dreamweaver/Xd/Aftereffects/InDesign and PremierePro why don’t you keep one Adobe subscription and purchase 4 Affinity licences? With the right work spread, you will archive same results saving yourself at least few hundred pounds! Are you thinking now, about the replacement for Dreamweaver? How about you try the Visual Studio Code? I’ll give you more details about VS Code next week. To sum up, we are really looking forward to seeing more from Affinity. It would be great to get our hands on new Publisher and even better if their next project will be for video editing software! For now, we can all encourage you to have a go and try Affinity products, save your self a bit of cash and enjoy reading our posts.